Fun Christmas and Holiday themed Dares for the Truth or Dare Game! Over 50 funny and silly Dares to use for holiday and Christmas parties. Great group game for kids of all ages, tweens, teenagers and adults! 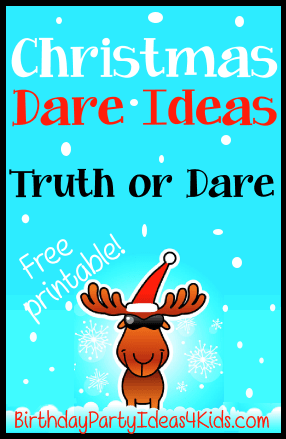 The perfect list of over 50 dare ideas with a holiday theme. Free printable! Print out the Dares, cut into strips and place in a jar or container before the party. Players choose either a Truth question or a Dare on their turn and must do what the Dare says. For more good Truth and Dare Questions see our Truth Questions page and Dare Ideas. For Kids, Tweens and Teens - Clean, Rated G for all ages. 1. Dance to Jingle Bell Rock. 2. Give Reindeer Dasher a pep talk - he hasn't been pulling his weight lately. 3. Dramatically say goodbye to Frosty the Snowman as he melts before you. 4. Act out the Night Before Christmas without using words. 5. Do the dance of the Sugar Plum fairy. 6. For the rest of the night you have to say "Do you hear what I hear" when the person to the left of you says anything. 7. Sing Frosty the Snowman while you act out the song. 8. You are the Grinch for the rest of the game. 9. Carry the person on the left of you around the room like a bag of Santa's toys. 10. Sit on everyone's lap and tell them what you want for Christmas. 11. You are Santa and everyone in the room (one at a time) has to sit on your lap and tell you what they want for Christmas. 12. Drink 1/2 Cup of Eggnog. 13. Act like a Cowboy Santa for the rest of the game. 14. For the rest of the game randomly shout out Christmas items or song lyrics. 15. Act out the 12 Days of Christmas Song. 16. You are the Abominable Snowman for the rest of the game. 17. Act out Rudolf the Red Nosed Reindeer song with only hand motions. 18. Make 3 Christmas ornaments out of tin foil. 19. Decorate the person to your right with Candy Canes. 20. Wear a Christmas wreath around your neck for the rest of the game. 21. Decorate your hair with garland. 22. Act out Santa Claus is Coming to Town. 23. Pretend to be an Elf fixing toys in Santa's toyshop ... and the players are the toys ... for the rest of the game. 24. You are going through the seven levels of the Candy Cane forest for the rest of the game. 25. Act like you are lost in the sea of Swirly Twirly gumdrops for the rest of the game. 26. You are an Elf of the Shelf and can only move when no one is watching for the rest of the game. 27. You are a Candy land gingerbread man game piece playing Candy land for the rest of the game. 28. Pretend to be in a giant snow globe for the rest of the game. 29. Make a Santa beard out of something in the room and wear it for the rest of the game. 30. You are the Angel on top of the Tree that has escaped for the rest of the game. 31. Put a bow on your head and say "I'm the best present of all" whenever anyone says _____________________________ (fill in the blank). 32. Challenge 1 player to see who can melt an ice cube in their hands first. If you lose you have to keep challenging players until you win. 33. Talk like Rudolf (when he had on the cover up nose) for the rest of the game. 34. Say "Santa! Santa's coming! I know him! I know him!" whenever anyone mentions Christmas words. 35. You are the Grinch's dog for the rest of the game. 36. For the rest of the game pretend it is snowing and make snow angels, have a snowball fight, make a snowman etc. 37. Call someone and ask what their favorite color is. 38. Use 10 things in the room and decorate yourself like a Christmas tree. 39. Go outside and sing Jingle Bells to the neighborhood. 40. You are Santa getting the reindeer (the other players) ready for Christmas eve. 41. Answer any questions using only Christmas carol lyrics for the rest of the night. 42. Hold mistletoe over each of the players and kiss the top of their heads. 43. For the rest of the night you have to laugh like Santa anytime you laugh. 44. Have a imaginary snowball fight with imaginary players for the rest of the game. 45. Talk as many players as you can into going with you to a neighbors and singing a Christmas carol. 46. For the rest of the game pretend to ice skate around the other players. 47. Make a paper snowflake for each player. 48. You are going over the river and through the woods in a one horse open sleigh for the rest of the game. 49. Wrap a player up like a present using toilet paper. 50. Sing Feliz Navidad whenever anyone says the word Christmas for the rest of the night.